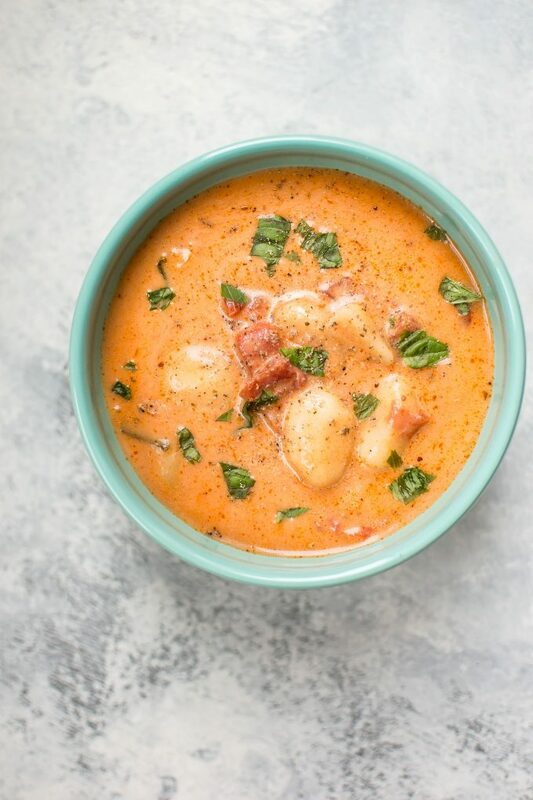 I’m going to put it out there that this creamy gnocchi soup is one of the best recipes I’ve ever put on my blog. I’m that excited about it. 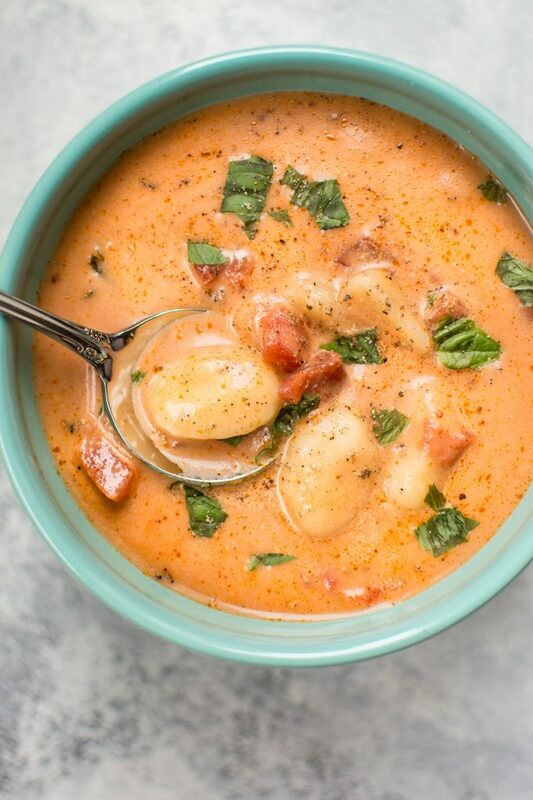 I LOVE tomato soup to begin with, but make it a creamy tomato soup and put gnocchi in it, and it’s sooo much better. 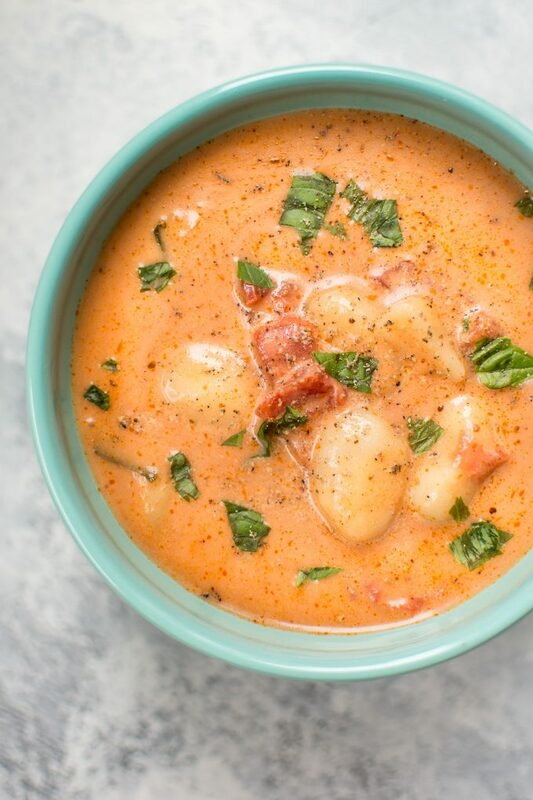 The potato gnocchi cook right in the soup so there’s no messing around with multiple pots. The gnocchi release starch, which thickens up the broth, and along with the cream, it’s definitely a recipe I’m now going to have on repeat in my house. Ok, so I’ll admit it isn’t the healthiest soup possible, but I found a small portion to be quite satisfying, and that cup of cream is distributed across at least 4 portions (more like 5-6), so it’s not too bad. This easy gnocchi soup was an interesting one to photograph. For some reason, I expected the gnocchi to float. That wasn’t so. This soup reheats well – I had the leftovers for work lunches, and I can tell you that I looked forward to them like crazy. The soup continues to thicken up the longer you leave it, so after a few days in the fridge, it’s really rich and luxurious. 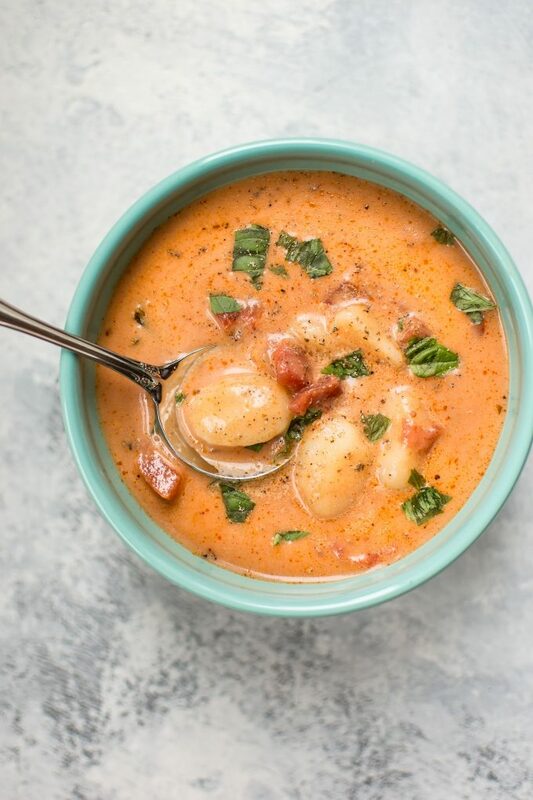 I really hope you give this creamy tomato basil soup with gnocchi a try… I know I will be making it again soon! Melt the oil & butter in a large pot on medium-high heat. Sauté the onion for about 5-7 minutes, or until it's lightly browned. Stir in the garlic until fragrant (about 30 seconds). Add the crushed tomatoes, vegetable broth, water, Italian seasoning, and gnocchi. Increase the heat to high and bring the soup to a gentle boil. Cover with the lid slightly ajar and reduce the heat to medium-low. Let it simmer for 10 minutes. Add the cream and salt & pepper, to taste, increase the heat to medium, and cook it for an additional 10-15 minutes (lid off). The broth will continue to thicken up a bit from the cream and the starch that the gnocchi releases. Add the fresh basil just before serving. Enjoy! Looking for more easy potato gnocchi recipes? I’ve got you covered with my one pan creamy tomato gnocchi and my one pan creamy spinach and mushroom gnocchi! This soup was delicious. I added a can of petite diced tomatoes and used chicken broth in place of vegetable broth. So good!! Really enjoyed this soup! My whole family (including the picky eaters) gobbled it up. I added some crumbed goat cheese on top. Yum! Made this with fire roasted petit tomatoes and beef broth. Pander with grilled turkey pepper jack sandwiches. Great Sunday Cold Sunday afternoon dinner. Wonderful soup. came across a picture of your soup on Tumblr. The photos are so delicious to look at. 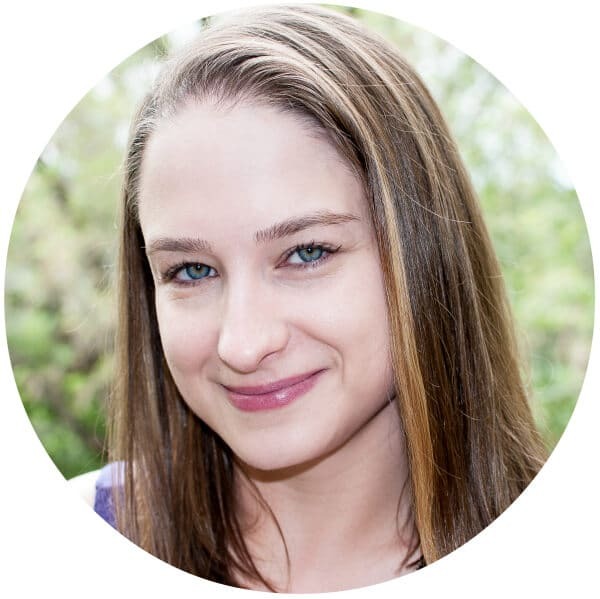 I’m happy there was a link to your blog too, so here I am and will give it a try the next days. Can’t wait to taste it! So glad you found me! Hope you love the soup, Pia! I made this tonight and wow it was amazing! I halved the recipe because I was only cooking for two. I also used diced tomatoes and used a hand blender for a few seconds bevauae I like my soups chunky! I also used half and half instead of heavy cream. It was delicious thank you! So glad you liked it, Kara!! Very yummy soup! Like an above poster, I used chicken broth and (because I was afraid of not having quite enough tomato) a can of petite diced tomatoes. Superb! My husband didn’t even whine about lack of meat. Haha that’s great… so nice when husbands don’t whine! 😉 So happy you liked it, RP!